Another Thursday - another 3CT challenge - this weeks challenge is Eat it! You must have a food image on your card. Well, let me tell you I don't own a lot of food images, so I had to scramble to find something to use. I dusted off my Party Hearty set to create this birthday card. Nothing really fancy - the bottom of the cupcake is paper pieced with Chocolate Chip card stock. So cute! Love the paper piecing you made for the cupcake! Very cute! Love the polka dot dp! Very cute card, Lisa! Love the polka dots! Great Card Lisa. 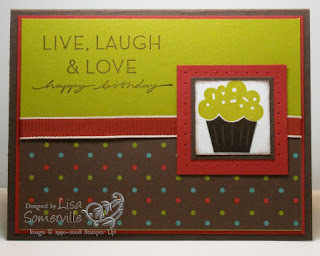 The colors are wonderful, I love that Polka Dot paper and I think the paper piecing on the cupcake is fun.